Science…! Yes science we all shout…! @zeonglow said something interesting while I was watching the latest episode. #yoml isn’t science. They should have matched up half of them at random. That would have been interesting. All the science in the programme is 2 scientists looking pretty saying comments like, “oh there a good match…” I would suggest the title is quite correct, biology lessons minus the science. 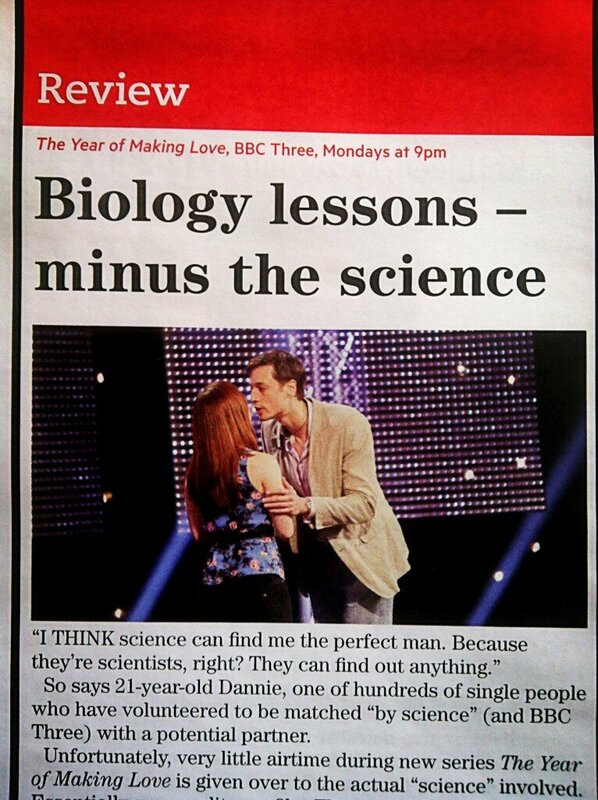 Unfortunately, very little airtime during new series The Year of Making Love is given over to the actual “science” involved. Essentially, personality-profiler Thomas and behavioural-psychologist Emma have analysed the assembled single masses and paired them off with one another. Imagine Yente, the matchmaker in Fiddler on the Roof, if she exchanged the layered shawls for a lab coat.